Word. Although his reasons are a bit different from mine. Interesting glimpse into the local hotel industry from Doug Small of ExpGR. This is a really great article (with data and graphs, swoon) about the overall housing market in the U.S. We've talked about a lot of these issues and how they are affecting the local housing market. In a nutshell, economy is about as healthy as an economy can get, but housing prices were getting too high. Bissell is adding about 25,000 square feet of office space at it's Walker headquarters. They expect to hire 100 new people. EDIT: The Press says up to 150 employees could fill the space, with a weighted average salary of $75,000. Not bad. A side note, I know Bissell is big into supporting pets, but you really don't hear their name much when it comes to philanthropy around town. I'm I wrong? 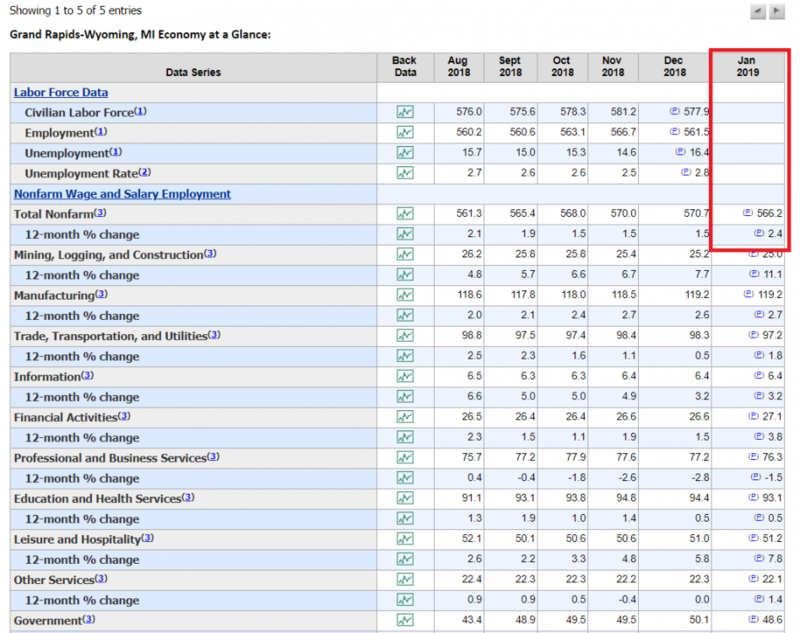 Grand Rapids back up to 2.4% annual job growth January to January. I guess they do that, than sponsoring a Sports Team, .....they have their niche...and a very nice one, in my opinion....It also works well with their product line....if you have a pet and go out and buy a vacuum, what brand are you going to buy? Expanded employment numbers are out from January 2019. GR Labor Force is up nearly 13,000 from this time last year. 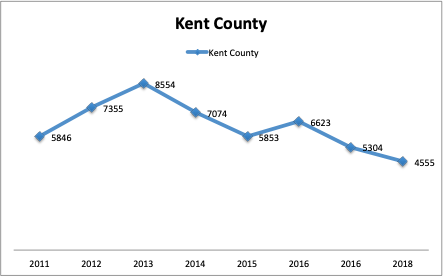 Kent County population growth estimates for 2018 are out. Kent County had the largest gain in the State of Michigan, both in overall numbers and percentage gain. Highest Gains in the state, but lowest recorded increase since 2010. They seem to revise GR/Kent County up every year, my gut is they will do the same here. 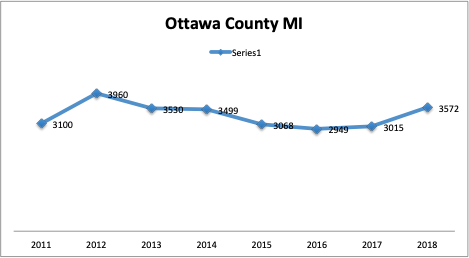 Ottawa County had the second largest increase in the state after Kent County, and it increased in momentum from previous years which offset Kent's "slowing". It appears periphery counties Allegan, Barry, Montcalm, and Newaygo are also continuing trends of accelerated growth, so the overall population trends of the region remain relatively constant. My question is why is Kent County trending slower since 2016? Is the county still slower in new SFH starts? Could the growth be partially affected by the current political climate surrounding immigration, as Kent County traditionally contains the lions share of the regions new immigrants? Michigan year over year % population gain ranked 37th, second lowest in the Midwest ahead of Illinois which lost population .. again .. for the 5th consecutive year. When looking at the 20 largest Midwestern MSA's GR finishes 7th in year over year growth rates and 5th in raw numbers. Grand Rapids holds quite well when you look at its peer metros in the 1-1.3million person range. Yep, if you talk to people on the East side of the State, things are pretty humdrum (except for downtown Detroit's recent boom). Suburban Detroit is in the doldrums still. The Pontiac/Flint/Saginaw Valley corridor is downright pathetic. You might be onto something there. I also think availability of "affordable" housing may also be hindering, or at least slowing, rapid growth. Here's 1st quarter real estate stats for GR, amount of inventory. It's still a very tight market. "U.S. News & World Report recently published several annual rankings of the best places to live in the U.S. Grand Rapids, Michigan took spots in three of the lists, landing No. 13 for overall Best Places to Live in the U.S. in 2019, and earning the No. 6 spot in both Best Affordable Places to Live in the U.S. in 2019 and Best Places to Retire in the U.S."
It's a geographical designation. Kansas has always been in the Midwest. There just aren't a whole lot of people from there to talk to in general. The point is it's relative, when you look at the actual number of people who moved to Michigan it's in the middle of the pack. The point is with Kansas, the Dakota's, Nebraska, and Missouri technically considered Midwest .. with all but Kansas exceeding Michigan's growth rate .. 2nd worse of 7 sounds better than 3rd of 12. I guess i'm not sure what you're point is. You posted a thread when the state numbers originally came out in December stating that Michigan ranked 22nd for overall raw growth. What narrative are you exactly trying to drive here, if you are comfortable posting it as above average in one thread, but are narrowing the scope of what the Midwest is , to show its inadequacies in another? South Dakota had the strongest growth rate in the Midwest at 1.02%, but Michigan outgained it by almost 11,000 people. Again what are you getting at? FWIW not only have I heard a Kansan say this, but said Kansan is a friend who seems to enjoy constantly arguing with me that Michigan isn't "really" in the Midwest. We're too far east, or something. If you review my post initiating the latest census figures it's specific to % growth .. nothing more nothing less .. no raw numbers. Draw whatever conclusions you feel, I'm keeping it factually consistent whether we're talking 7 states or 12 from a Midwest perspective or nationally. % growth. Interesting, I wonder if that's shared from people living in Rapid City, SD or Williston, ND. Guess so as Lebanon, KS is near the geographic contiguous center which really does make Michigan pretty far east. Maybe MJLO can give us a breakdown of State population growth for the Great Lakes States (Wisconsin, Illinios, Indiana, Ohio, and even throw Iowa in there). I'd love to see 2017 - 2018 and 2010 - 2018 in raw numbers and percentages. Those to me seem to be the only states that we really compare to. I think we're more like Pennsylvania than we were like Kansas or even Missouri. In fact, we're closer to Kentucky than we are to Kansas and no one in their right mind would put us in the same geographical category as Kentucky.